Best chocolate cake EVER. Best. And I do not say that lightly. This is so rich. And it isn’t one of those recipes where you have chunks of zucchini in it still. 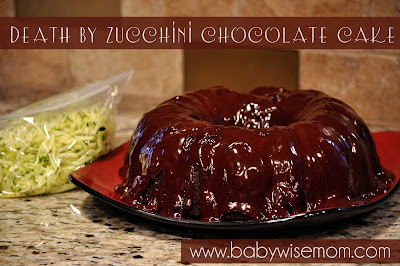 But I am sure to tell my kids there is zucchini because I want them loving and appreciating the vegetable. If you grow zucchini, you know you have to get creative in using it (and if you don’t, but know someone who does, casually mention you don’t grow it…they will claim you as their own and deliver it to you regularly). I found this on Pinterest–here is the direct link. Add all ingredients into the bowl of a stand mixer, reserving the zucchini and chocolate chips, and mix with a paddle attachment until a smooth batter forms. Pour the whipping cream in until almost level with the chocolate chips. Spoon over the cake before serving. NOTE–we tried this with white chocolate chips for the gnache instead of dark chocolate. My husband liked it better, but I didn’t. I think peanut butter chocolate chips would be fun, too. Previous Post Scheduling Homework Time/Piano Practice Time/etc. I made this for my husband's birthday cake, and boy was it a hit. Everyone loved it so much. Two of them guessed that it was a zucchini cake and one wondered if it was spinach. Makes me want to do a spinach cake for him someday – he loves Popeye. 🙂 It was absolutely delicious, but very rich and sweet!